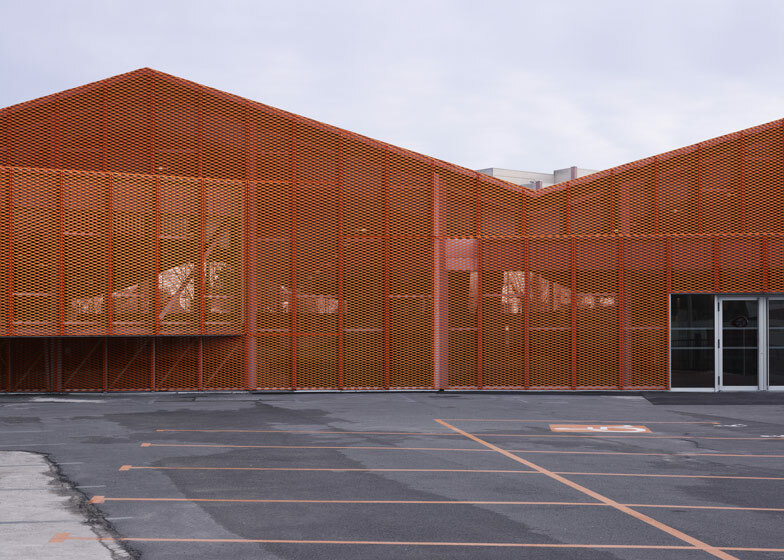 Slideshow: French studio Bang Architectes has converted a former peanut factory in Calais into a skateboarding park with a bright orange mesh facade (photos by Julien Lanoo). 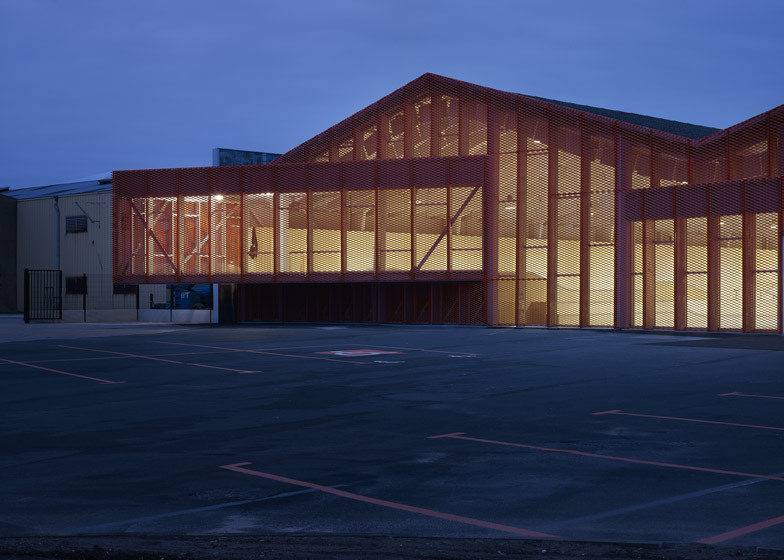 In order to increase natural light inside the warehouse the architects removed concrete walls from the east and west elevations and replaced them with glazing, screened behind the layer of steel mesh. 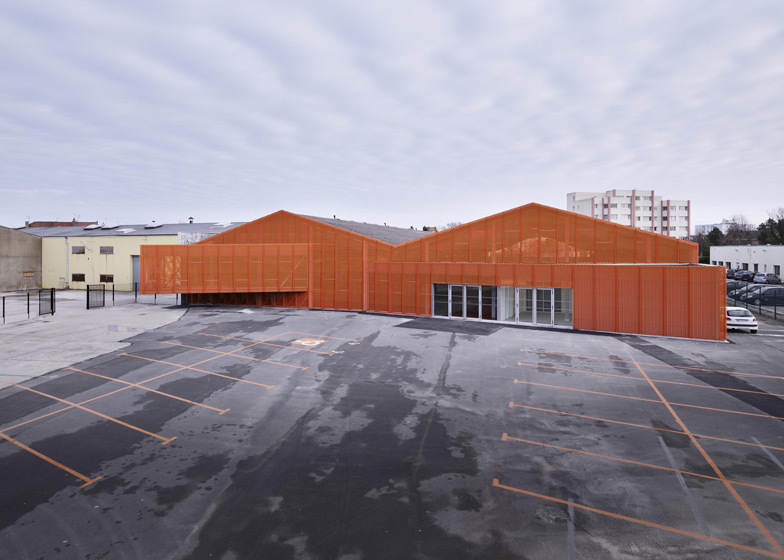 Two new volumes project from the facade to reveal the locations of a youth centre positioned along one edge of the building and a raised platform opposite accommodating more skating tracks. An enclosed passageway with entrances at both ends crosses the width of the building to provide a safe place for spectators to stand. 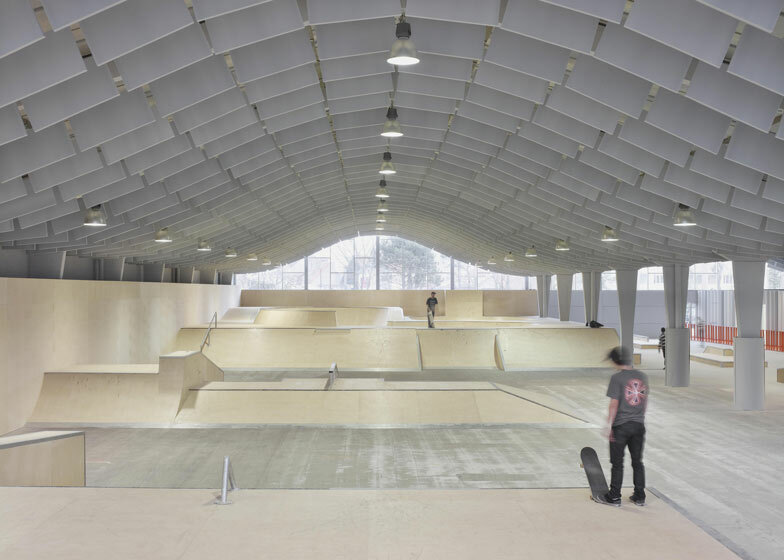 If skateparks grab your interest, check out one designed by a skateboarding champion in Germany. 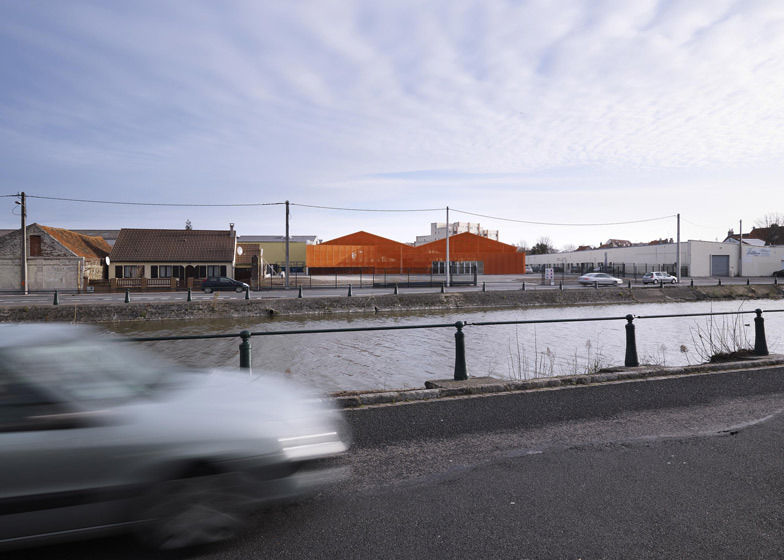 The operation takes place along a canal in St. Pierre, which is the former industrial district of Calais. 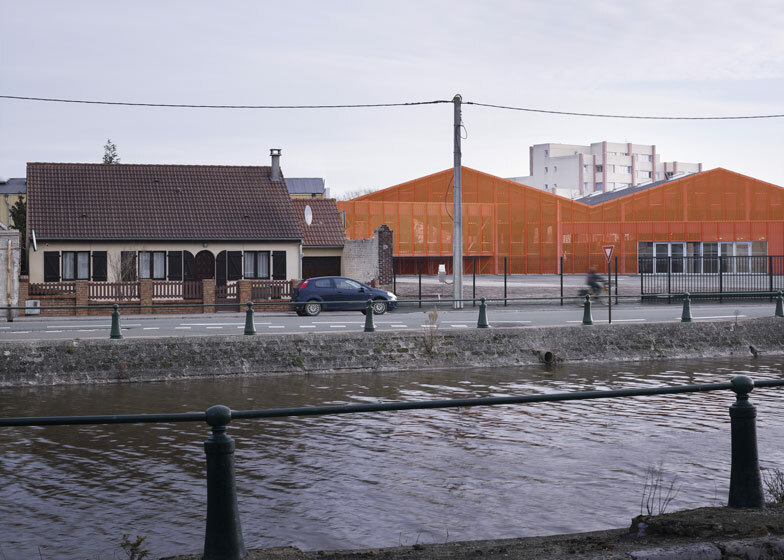 It continues the urban renewal initiated by La Cité de la Dentelle (by Moatti & Rivière Architects) located a hundred meters downstream. 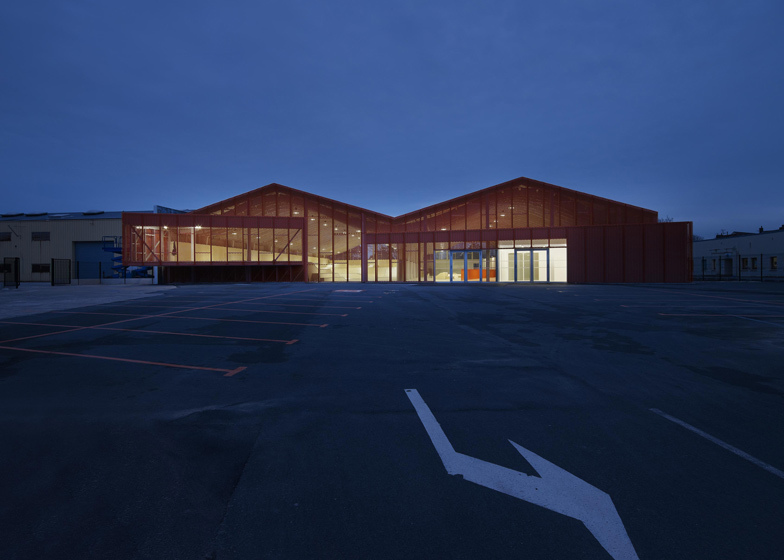 In this bleak urban landscape, the conversion of the existing industrial hall has to be visible. 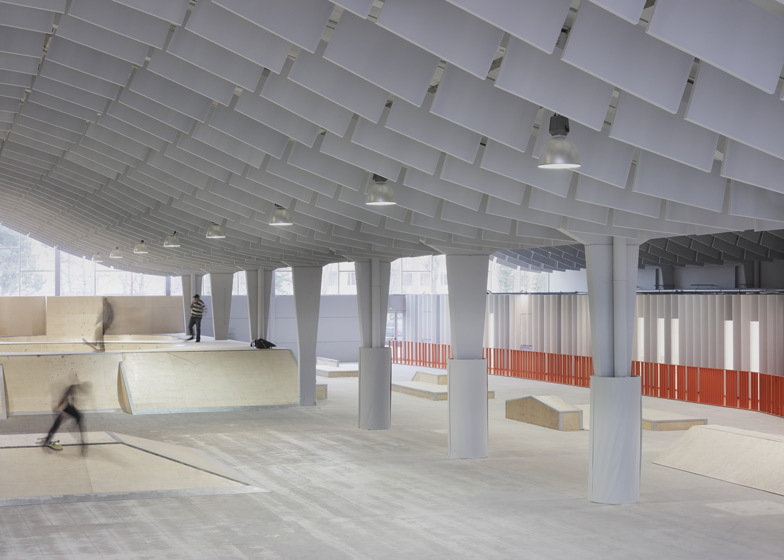 The future facility must signal its presence and invite potential users, the young and curious, to enter. The high clearance at the front of the building offers increased visibility of the west gable from the surrounding area. This gable, which has been completely redesigned, will project a strong signal into the public space. The existing building is a common industrial hall with no outstanding features, consisting of a concrete structure filled with precast concrete panels and a roof of cement sheets. The hall was once a roasted peanut factory, followed by various other incarnations (including a go-kart track) before being abandoned for several years. Prior to handing and processing it had been dilapidated, vandalised and had become structurally unsafe. The first task was to open the dark hall before curettage and structural recovery. This was achieved by removing precast concrete panels on the eastern and western facades to release through-views and bring natural light into the heart of the building. 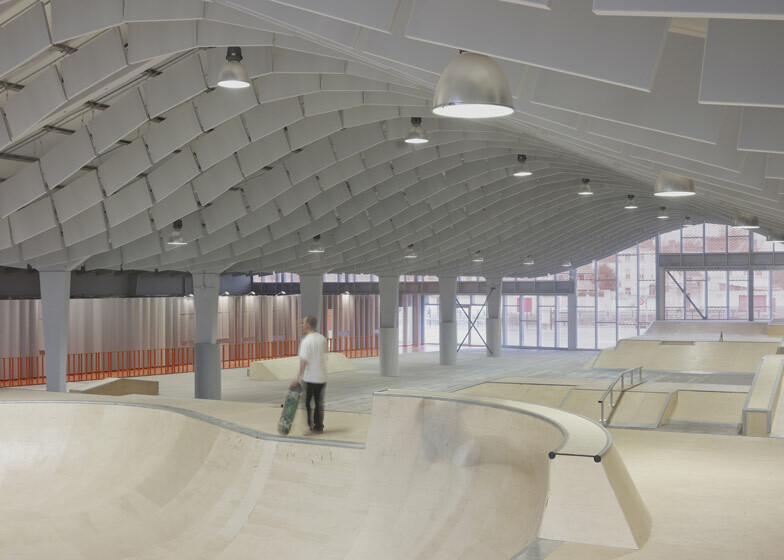 The youth centre and the skate park extends beyond the gable and form two protrusions, which clearly signifies that the building has a new purpose. 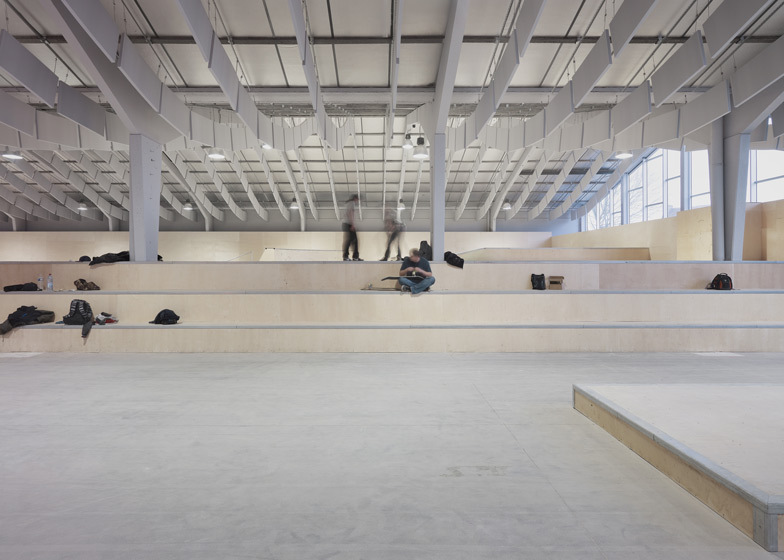 One protrusion stands on the floor and emerges from the skateboarder club and youth centre, forming a point of contact between the inside and outside space. The other is cantilevered and a launch pad that overlooks the front square, featuring skaters waiting in turn before taking off. The two prismatic volumes, like opened arms, reclassify the free space of the front square and act as an invitation to enter. The architectural expression is unified by a common envelope made of expanded metal, which turns the silhouette from a hanger into a prism protruding from a singular hybrid form. 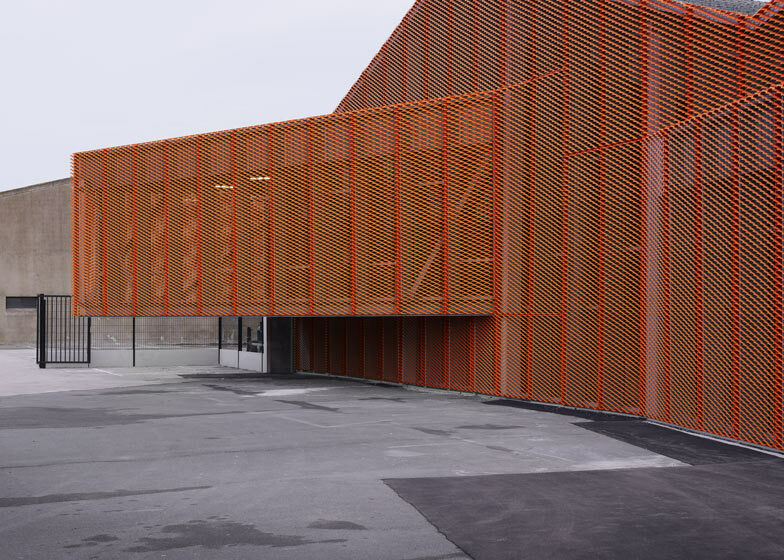 The metal mesh allows spectators to watch activities inside and is gradually perforated from top to bottom. The mesh acts like a shutter, controling direct sunlight and the color is stricking; it is deliberately conspicuous. This colorful mesh protects the equipment as the expanded metal is very resistant and anti-graffiti. It is doubled with a curtain wall to protect users from prevailing winds and reduce any noise nuisance to nearby houses. 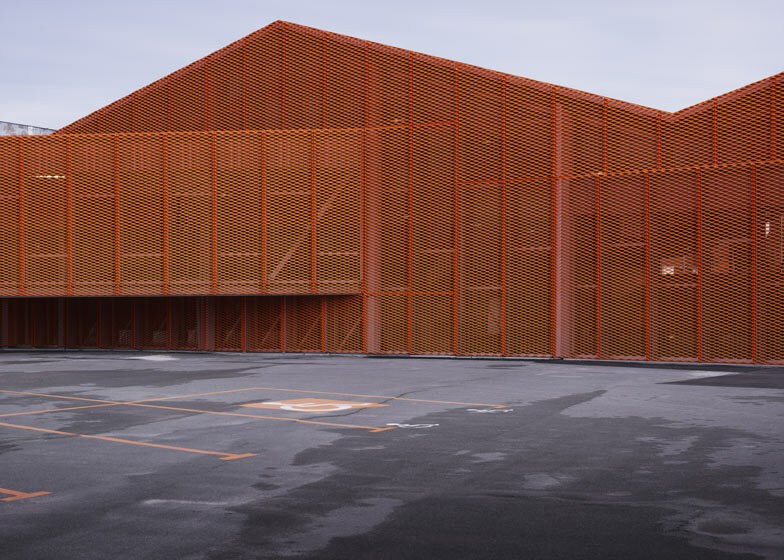 Outside the building the front square is treated using an orange frame to draw parking spaces, which overlap the textures of the existing floor coatings. Inside the hall the various program elements are organised longitudinally, to optimise the length of the skate tracks and provide an entrance to the youth centre along the southern facade. When entering the building, there are a series of enclosed and heated rooms installed on the right identified by emerging prism. This set is built with a light frame and placed on the existing slab, with entrances distributed along an indoor walkway. 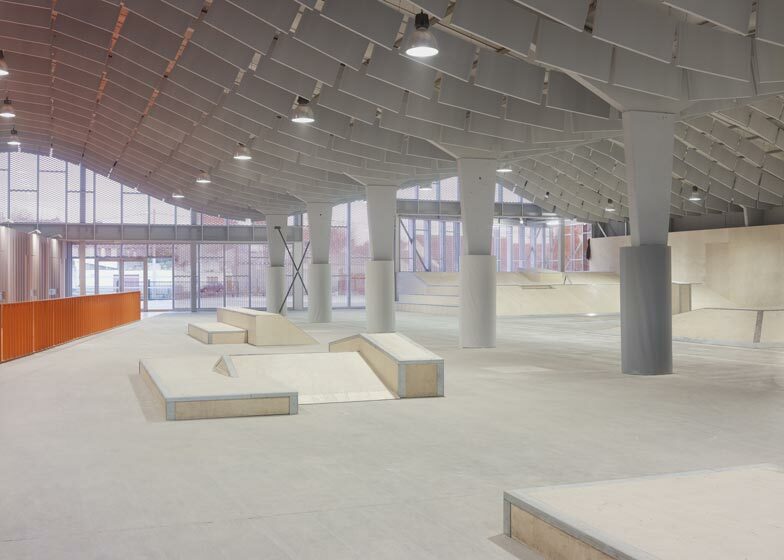 This walkway is fully integrated into the space used for the skate park, separated using a handrail that runs its entire length. It enables "spectators" to watch the skaters safely. The long wall is covered with an acoustic fabric stretched to form large "dimples". This absorbing surface is designed to reduce reverberated sounds caused by skateboarding on hard surfaces. 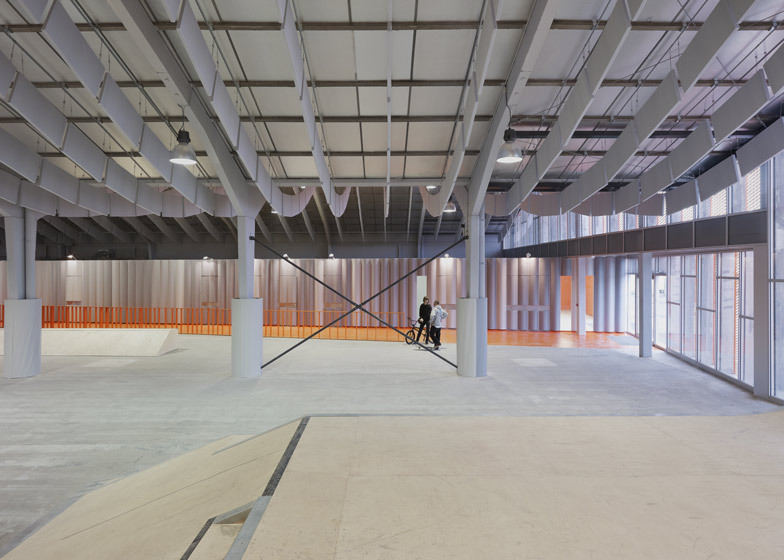 The wall is also provided with vertical windows offering views for both users of the skate park and youth centre. A sinusoid layer of large acoustic baffles is suspended from the ceiling to increase acoustic comfort for users. These technical elements offer inexpensive modifications that morph the inner space and hide the unsightly ceiling. The modules are arranged in a strips logically oriented along the full length of the hall. On the west side a raised platform overlooks the front square. It serves as a high point: the launcher. The bowls (rare in the region) are installed at the east end of the hall to maintain space clearance. These complex curved surfaces are works of joinery and carpentry of great sophistication. In the center of the hall is the funbox. A calm initiation zone is arranged along the indoor walkway and punctuated by modules. 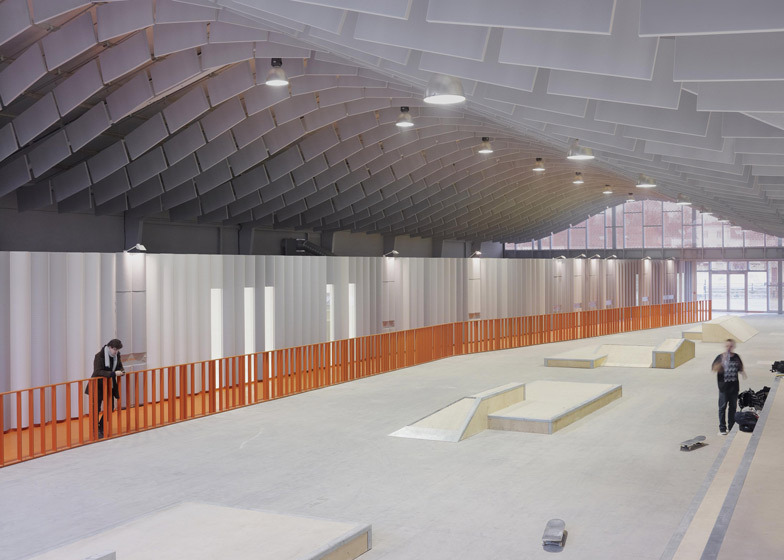 The modules are made of wood (not concrete) to maintain the adaptability of the skate park and the reversibility of the original allocation of the hall. 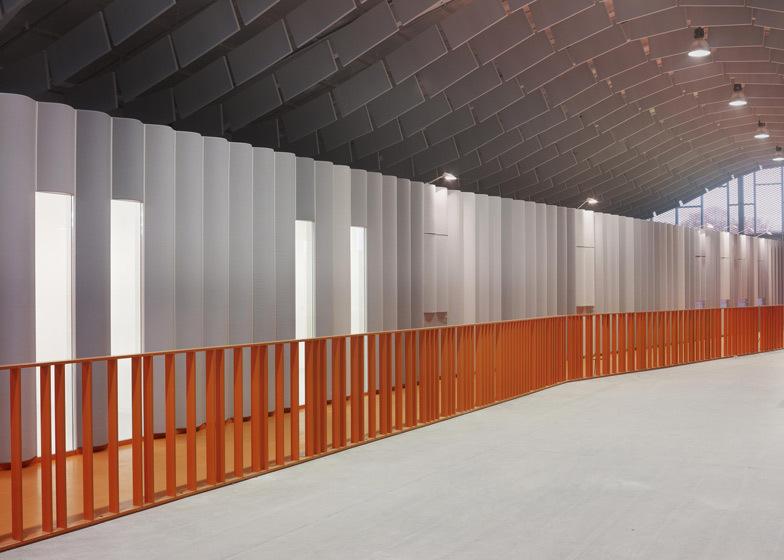 Acoustic wall on the indoor street: textile glass fiber coated with PVC stretched over two layers of cotton batting and put on a sheet of extruded PVC formed. Skate joinery: wood frame and covering in birch plywood from Finland coated by a clear glaze. External joinery: aluminum with double glazing. Roofing of emerging volumes: self-protected bitumen. Total cost: 1,5M € H.T.